Welcome to part 1 of 5 in our series Scaling Your Divi Web Design Business where we’re exploring proven tactics and actionable strategies that will help you grow your Divi based web design business. For many freelance web designers, there comes a point where you need to thinking about scaling your business. This could come intentionally or unintentionally and it can be very overwhelming. The good news is, there’s help. This series will provide you with actionable and practical strategies on how to scale your web design business no matter if you’re just wanting to grow slowly from a one man shop or if you’re wanting to quickly build a full fledged web agency with a big team. And the best part is, this series isn’t based off of theory or some dated academic program, it’s a culmination of experience from several established Divi Web Design business owners who are currently in the thick of it. While many of the strategies and ideas presented in this series are intentionally catered to Divi Web Design, there’s room for implementation by any sort of web design business as well as those running a Divi based product business. Keep in mind that these recommendations are not a matter of “right or wrong.” These are methods, tactics and strategies that have worked for others and are open for interpretation depending on your desires or situation. They can be applied no matter how big or small your business is or how big you’d like it to be. Perhaps most importantly, this series isn’t just based on my experience, methods or ideas; it’s based off of several established Divi community members who have successful growing Divi web design businesses. I asked many of the same questions to all interviewees and while I received many similar responses, I also got many varied answers based off of their own experience with scaling their businesses. Why did you scale your business? How did you know when you were ready to scale? Did you have money saved up or account for the extra cost in to be able to scale? How do you centralize communication with your team? What tools do you use for project management, calendars, due dates, etc? What are some of the struggles you’ve experienced with scaling your business? With the variety of answers I received, it affirms what I stated above in saying that there is truly no “right or wrong” way to scale a web design business. It all depends on where you’re at in your endeavor and your situation. So now that we’re prepared to prepare, let’s dive in! You’re overloaded and can’t keep up with your workload – In the world of freelance web design, if you do good work, do it on time and provide great communication, you’ll likely end up in this situation before long. I imagine many of you can relate if you have found yourself with more work to do than there are hours in the day to get it done. If this is you, then it might be time to start thinking about scaling. This is one of the most common challenges for successful web designers. It’s a great challenge to have, don’t get me wrong, but nonetheless it is a challenge. Unless you start charging significantly more and begin saying no to most new business, you’ll likely not be able to continue doing it all on your own. And if you’re not prepared to scale, you’ll quickly get behind on your projects, not meet your deadlines and run into a potential slew of other issues that will arise. You want to have the freedom to do what you do best – I’ve found that there are two kinds of people in business; those who prefer to do everything themselves (like me) or those who very quickly delegate what they don’t want to do or what they’re not good at. If you’re like me, you probably wear all the hats in your business and for the most part, enjoy taking on all of the roles. But you (like me) probably realized that for all the strengths you have, there are an equal amount of weaknesses. Scaling your business is a great way to free you up to do the work you’re either good at or love to do. You want to provide work and opportunities for others – Another common reason you may want to scale is to provide opportunities for others. Recently, I’ve often felt that it’s almost selfish of me to take on work that I could be contracting out. I could be giving others the experience that I wish I could’ve had perhaps 5 or 6 years ago as an aspiring web designer. And I must admit, your mindset will change in an incredible way when the purpose of your business is greater than just yourself. Having intentions of giving others opportunities and being transparent about that with your clients can bring a whole new level of satisfaction to your work. It’s also a great way to combat the loneliness that often comes in the life of a solo web designer! While we’re lucky to have the incredible Divi community to interact with, actually collaborating with other designers and developers can increase the feeling of being in community even more. So now that we’ve covered a few reason why you might want to scale, let’s explore 3 important pieces in preparing to grow your Divi web design business. Effectively scaling any business starts with your mindset. When you’re a freelance web designer, you’re juggling the roles of multiple people which can lead to multiple mindsets. When you’re juggling all these hats, it’s easy to lose sight of where you SHOULD be and where your true strengths lie. As mentioned above, you may be similar to me in that you’re comfortable in wearing all the hats and that mindset, while very beneficial as a one man shop/solo freelance web designer, must be changed if you’re going to effectively scale your business. It would behove you to realistically self evaluate yourself and find out your strengths and weaknesses. One resource I’ve used in the past and would recommend is StrengthsFinder 2.0 to find your strengths and weaknesses. You might also consider taking a DISC Personality Test to find out what personality types you have in order to effectively lead and work with others. Perhaps the most important lesson I’ve learned in this area recently is to think of yourself as the CEO/president/owner (or whatever term you’d like to use) first. During the gradual growth of my business since 2010, I’ve always viewed myself as a web designer first, then a graphic designer, then the owner and other roles to follow. Since I’ve begun my quest to scale, my mindset is now as the owner & leader first, then web designer, salesman, etc. The reason this is so crucial is because in order to scale, you have to be the leader unless you’re in a partnership with someone who wants to take that role. But if you’re a solo web designer, more than likely you’re the leader and the “captain of the ship” per say. From a business financial standpoint, this is even more critical. Case in point, I’ve seen good growth in my business for several years but I’ve always wondered…”Why don’t we have more in the account? ?” Among other reasons, it’s because I’ve created essentially a solid full time web design job but I haven’t put the systems in place to dedicate more time in the other roles to take the business to the next level. Profit margins, baseline costs and other terms of the like tend to get a bad rap in the freelance world but are important to consider if you’re going to scale. The main reason this is important is because once you have enough revenue coming in to hire out, you need to make sure there’s enough profit margin to sustain you as the CEO. 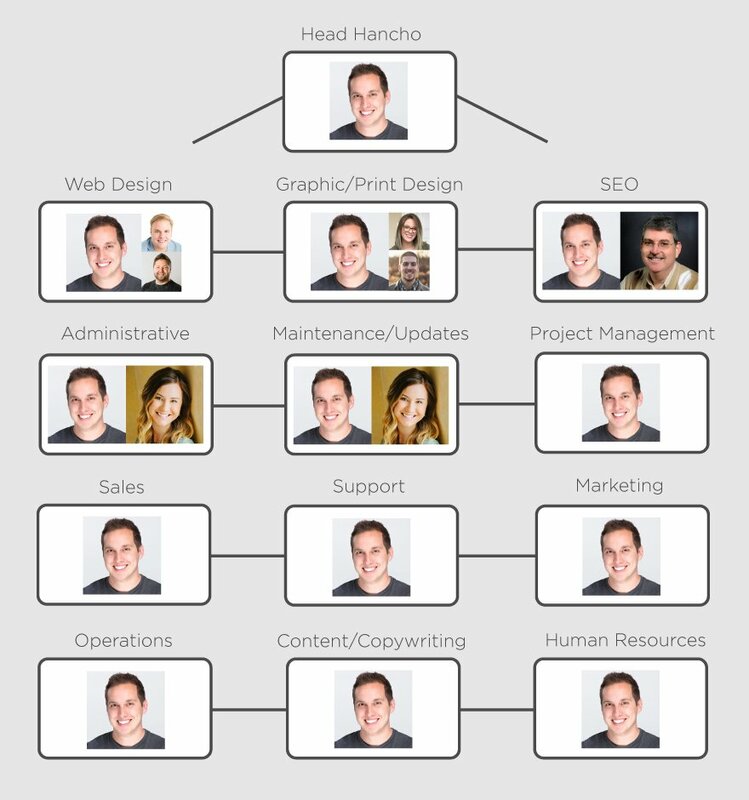 One practical way to do this is to create an Org Chart (Organizational Chart) with all the main roles in your business. In the case of most freelancers, your picture will be in every role. As you begin to scale, your goal is to fill in those positions with more pictures i.e. – your growing team. Here’s a look at my current org chart. These are, among others, the main positions in my business. While I have some team members assisting me in some areas, I’m still actively involved in every role. The goal is to fill up those positions with other pictures, either subcontractors, part-time or full-time team members, in order to free yourself to do either what you do best or to do the work you love most. Again, it all starts with your mindset! Across all my interviews, I learned that if you’re going to scale, your process MUST be something that is written out in detail and is something that can be replicated. 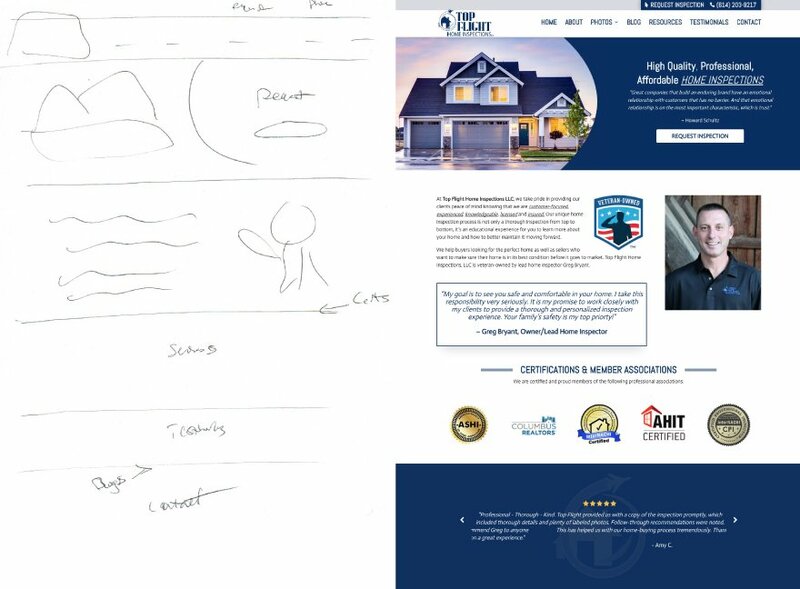 As a practical example, I’m self-admittedly bad at quickly sketching out my initial design ideas like a 3rd grader then diving straight into design with Divi. Here’s a recent example of one of my initial sketches to the final design. Exampel of intial sketch for a project completed in Dec 2017. I tend to like diving right into Divi when designing sites but the only reason this has worked out for me is because to this point, I have been designing on my own. My initial sketch just got the ball rolling for the layout that my trained web designer mind was able to see. But, this is not going to work as I scale my business 🙂 I can’t expect a designer at any level to look at that sketch and come up with this final design. So it’s important to get your design and development process written out in detail. Even if you’re still a one man shop, you’d be surprised how getting things out of your head and on paper or on file will dramatically help free your mind up. We’ll dive more into practical ways of doing this in the next post. Finally, and similarly to preparing your process, is to prepare your systems. By systems, I’m referencing proposals, invoices, contacts, internal team and client task managers, project managers, etc. All of these systems are at play the moment you start designing websites. If all of these things are disorganized and scattered, scaling will prove very complicated and costly from a financial and time-wasting standpoint. I get it, the term “Systematizing” might make you shudder but if you look past the corporate facade that has tarnished the term, it’s actually incredibly freeing. In short, systematizing is all about freeing you up to do what you love to do. More on this in the next post as well. Well I hope this first post has inspired you for what’s to come! Again, I intentionally began the series with this concept of mindset because in order to effectively scale any business, it all starts in the mind of the person who’s running the show. And if you’re a solo freelancer who owns his/hers own business and wants to go to the next level, that’s you! Do you any initial thoughts or experience on preparing to scale a web business? If you have any feedback on this first post, feel free to share in the comments below! Join us for part 2 as we’ll be diving further into how to solidify your systems and processes in order to effectively scale your Divi Web Design Business. Till then! Thanks, Andrew! No problem. Yeah every interview is absolutely jammed packed with pure GOLD wisdom and experience. I have literally followed all of the advice from these interviews since recording them last month and am already seeing the benefits 🙂 Can’t wait to hear how this series helps others as well. Had to translate that one 🙂 Thanks, Pablo! It is a very important article that deals with a subject that we designers keep in a corner of our heads every day like you said. Thanks Josh, My English is a little rusty. Anyway… every day, I think these subjects. I founded a Non-Profit Organisation in 2013, we have over 60,000 registered students, many of whom are tech savvi. If we can equip some of them with Divi, they could become a massive resource for a project such as this? i.e. anyone wanting to scale has access to a pool of undergrads / distance learners / new graduates. Pre screened by us and equipped by you? Thanks to ET – great work as always! Wow, it was so great to hear from all these awesome designers and Divi business owners! I particularly loved hearing from Sarah since she is in a similar position to me. It was awesome to hear her goals and how she plans to achieve them. Thanks so much Josh for putting this together, its a really valuable resource! Awwww… Now I can’t wait to see part two! It’s nice to see how other business owners have scaled and continue to scale. Yo, Josh! Are these interviews available in audio only form (podcast maybe?) so I can listen to while driving or running or something on my iphone? Thanks a bunch. Great article Josh! When do the following articles get published? I am in the midst of trying to find more team members. Thanks, Alex! Sounds like this series will be right on time for you 🙂 Part 2 and 3 come out 2/17 and 2/18. Then parts 4 and 5 come out next week 2/22 and 2/23. Thanks for the feedback and I truly hope this series helps you out! You’ll have to keep me posted and let me know how it helps. Thanks, Josh. I am nowhere near even considering scaling, but this is awesome information and inspiration to hopefully one day be able to quit my day job and build up my web/graphic design business instead. Thanks so much for your thoughts and insight, Sharon! Yeah this series, while intended for those thinking about or ready to scale, is also hopefully some inspiration for those not quite ready. But when the time comes, hopefully this will be a resource you can come back to! Thanks, Aldin! Really appreciate your feedback. No doubt that the Divi community is, in my humble opinion, the best there is online! The question is: how did you define your growth? What does it mean that there was growth in your business without making more money or hiring more people? Hope that helps clear up what I was trying to articulate there! “You’re the limit of your own success” is the quote that I would use to sum that up. Much enjoying this series of interviews. I’m on the 3rd one and it’s all good. Thanks for the effort put in to make something useful. One minor thing: I did check out the viva design studio site (it’s wonderfully done!) but the contact page has this bit of code showing: [caldera_form id=”xxxxx”] rather than the actual form. This sort of glitch happens, I know. But perhaps you guys can bring it to her attention. Thanks for everything. Thanks for your feedback and for checking out the interviews!